Young Tomi, far from his home in India and all alone at the Circus Magenta, is being bullied by older boys. When Cyrus the head clown finds him, he has been badly beaten. Knowing he must help him, Cyrus takes Tomi to his trailer and nurses him back to health. As Tomi grows healthy and strong, so does his newfound faith in Jesus. With his new friends and a safe and happy home with Cyrus, life is good for Tomi. One night, Tomi’s performance in the circus ring goes horribly wrong, endangering his life and testing his faith. Will Tomi ever come back from being Bullied? 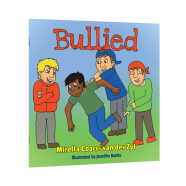 Bullied is the third children’s book from CODP author Mirella Coacci van der Zyl. Mirella was born in Torino, Italy, during WW II, the second of five children to a Baptist minister. Mirella grew up knowing the war but also the life of the Church. She came to Canada in 1965 and followed theological studies, and eventually was ordained into the ministry with the Canadian Baptists of Ontario and Quebec. After almost twenty years as a chaplain in various hospitals, Mirella retired in 2005 and began her writing career. Her stories have appeared in the local newspaper, the Brantford Expositor, and numerous religious magazines. She is the author of On Call for God, a book about her experiences as a chaplain; Toy Guns, Childhood Memories of War; Silva’s Journey; Nonna’s Chair; and now Bullied. You can get your copy of Bullied, as well as Silva’s Journey and Nonna’s Chair, in our store!